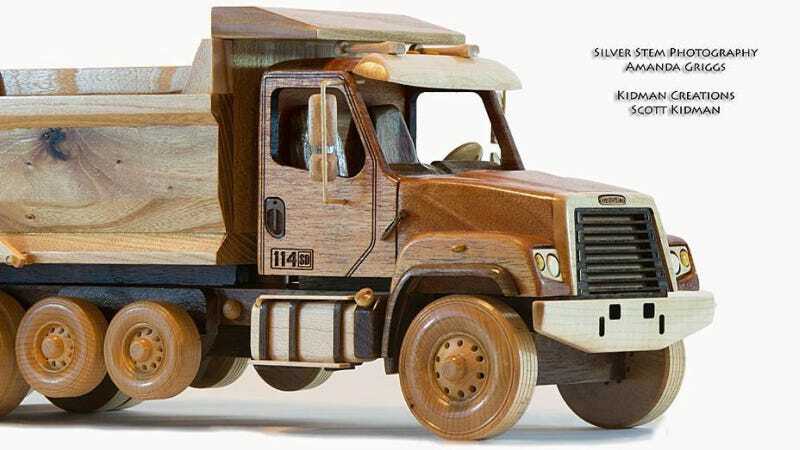 Freightliner is giving away some miniature 14SD dump trucks, intricately wood-carved by artisan outfit Kidman Customs. They're nothing short of gorgeous, and I just want to spend the rest of the day staring at these pictures of it. The models measure 48", with spectacular detail and a working dump bed. Kidman has churned out heaps of amazing machines made of wood, which you can look at albums of on their Facebook page. You can take a shot at winning your own by entering Freightliner's photo contest. Anybody else ever attempt an art project like this?